Greetings From Fabulous Las Vegas!! 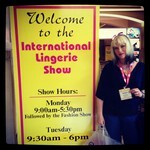 First up was the “International Lingerie Show” held at the Rio Hotel. The show is a broad spectrum of the finest hand Made Lingerie to 50 Shades of Grey Adult Novelties mixed with all sorts of glitter & glam! We navigated our way through the show and found some real gems to bring back to the shop! We’ve ordered some beautiful 40’s era old Hollywood eye candy from “lulu & Kath” where the designer walked us through every piece of the line. The line is more on the spendy side but when you feel the fabric and see the craftsmanship you will understand that this is just something you must have! The line is made for women that need slight shaping without feeling like they are in metal armor. This is a line that will be one of my all time favorites! 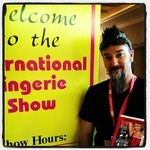 We also got to meet the girls from “Dirty Doll’s Lingerie” out of New York City. This is another one of those lines that you need to touch the fabric then ohhh & ahhh over the amazing attention to details! “Dirty Dolls” is also inspired by vintage under-pinnings worn by the Starlets of Hollywood’s Golden age…their tag line is “Bring glamour back into the everyday!” and they do deliver! French lingerie is often times a luxury that most students & working girls can’t afford…that is until now! We found a line called “Oh la la Cherie” sweet little confections that brings French quality with very affordable prices! We think that this line will be a real hit at Bombshell! That’s it for now darlings! We are on our way for one more day of the “Lingerie Show” & then later in the afternoon off to meet with Don Welch & Tony Hsieh from the “Down Town Project” to further discuss our plans to put a Bombshell in Old Vegas in the Fremont Street area!